I will concede that we don't know everything about the circumstances that led to Philando Castile's death. What we do know, however, is that it would seem like Castile did everything Black people are taught and learn to do when interacting with the police; all things we're taught and learn to do to avoid what happened to Castile happening to us. He pulled over when stopped and didn't appear to resist, verbally or violently. He alerted the officer to the weapon he was carrying and his permit for said weapon. There was even a four-year-old in the car with him. And you'd assume that the presence of such a young person would conjure some sort of empathy and caution with the officer. But nah. Anyway, since what we've been taught and learned obviously doesn't work, I've taken the liberty of creating a helpful and practical list of things to do and don't do to avoid getting shot and killed by the police if you happen to be Black. This is perhaps the most vital part of the list. Avoiding being Black is the best, most surefire, and most reliable way for Black people to avoid getting shot and killed by the police. Of course, it's quite difficult for Black people to not be Black. But no one said staying alive should be easy. If you want easy go play Taboo against a cat. This is also key. Because if you have Black parents, siblings, or children, there's a pretty high likelihood that you're also Black. Which would negate all the work we just did in number one. 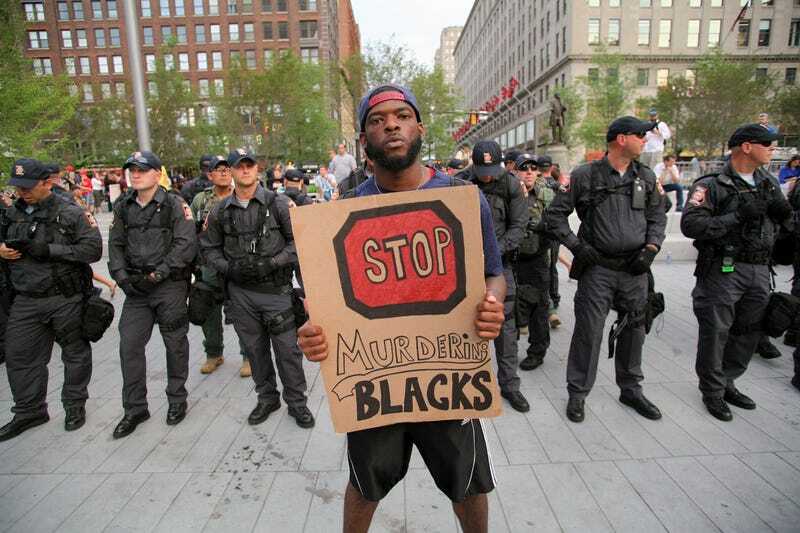 Although many non-Black people — including some actual White people (and even some White cops!) — have Black significant others and Black friends, if you have a Black significant other and/or Black friends, statistically speaking you're more than likely to be Black too. As numerous studies have confirmed, if you happen to have a Black neighbor, you're probably Black too. And if you're "probably Black," that's Black enough to get shot and killed by the police. Because if you happen to live in Detroit (82% Black), Jackson (79%), Birmingham (73%), Baltimore (63%), or Memphis (63%), there's a disproportionate chance of you also possessing potentially deadly Blackness. Although you'll find non-Black people at HBCUs and in historically Black Greek organizations, the people at these schools and in these organizations tend to be Black. (Even Kappas.) And people who tend to be Black are usually Black, and "usually Black" is just as dangerous as "probably Black." Because if you happen to do any of these things, you're either Black or you've spent so much time around Black people that you're an honorary Black. And not a fake honorary Black like Bill Clinton. But a real honorary Black like Rex Chapman. Which matters because real honorary Blacks are Black adjacent enough to get shot and killed in the crossfire too. Because not only will you probably be Black, you'll be the Blackest Black people the McDonald's people and the Chrysler people could find. And it won't even matter how happy and non-threatening you look holding a Premium Buttermilk Crispy Chicken Bacon Clubhouse Sandwich or cruising around with your impeccably dressed buddies with unusually bright teeth in a surprisingly roomy Pacifica, you're Black so you might die if you see a cop. Because only Black people do this. And if you happen to do something only Black people do, you're more than likely a Black person. And if you're more than likely a Black person, there's nothing you can do to completely rule out any chance of getting shot and killed by a police officer. So have your meat ready.